Bottom Line: A blistering psychological thriller that will have readers begging for a sequel. Buy it. When it comes to her clientele, psychologist Kathy Smith – who is also a gifted psychic – has become something of a specialist. Smith takes on murderers, rapists, pedophiles, thieves, violence, junkies and other “generally nasty people.” But she’s taking a year off from her practice to take on a passion project – the extermination of certain men on her list. However, her quest is stalled when she runs into Detective Chief Inspector Spinoza, who doesn’t approve of Kathy’s brand of guerrilla vigilantism. That storyline alone would be more than enough for most thrillers. However, author Julie Hodgson works in a few intertwined narratives as well, including that of Suri, a teenage girl from Malaysia who Kathy’s best friend drops on her out of the blue. But the tension and drama surrounding Kathy’s hit list is what really keeps the story rolling. As Spinoza and Kathy struggle, their conflict leads to an additional layer of depth that goes beyond the typical protagonist/antagonist relationship. Hodgson, who is also a children’s book author, proves with Nemesis that she’s ready to get in the deep end. In an era when women’s marches and the #metoo movement has taken feminism to new heights, the novel seems particularly timely. 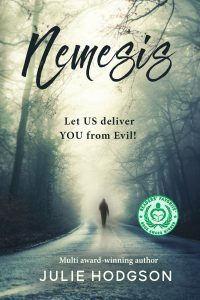 But Nemesis is far more than a simple revenge thriller with good timing. Crafting a sophisticated psychological narrative isn’t child’s play, but Hodgson makes it look easy. Readers looking for a fast-paced read will love the book’s breakneck pace, as characters barrel through their respective plots, and the action comes fast and furious. Let’s hope Hodgson isn’t done with this compelling cast of characters.